Abstract: Dual energy CT (DECT) exploits differences in how a substance behaves at different x-ray energy levels. This is particularly useful for iodinated contrast, which is significantly more attenuated at lower kVp settings. Using two datasets (typically 80kVp and 140kVp), standard images can be reconstructed. However, it is also possible to create virtual non-contrast images, where iodinated contrast is subtracted from the scan, or iodine-only maps, where only regions perfused with iodine are displayed. Further to this, on unenhanced studies, virtual non-calcium images can be used to detect processes infiltrating or in close proximity to the bones. 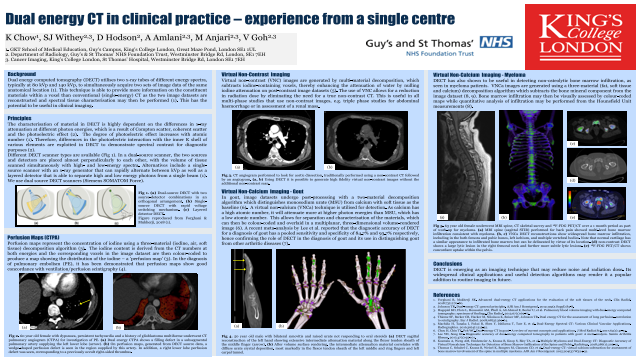 At Guy's & St Thomas' NHS Foundation Trust we have 3 Dual Source CT scanners. We routinely use the DECT capabilities in clinical practice. On DECT pulmonary angiograms, iodine maps can be generated and superimposed on the anatomical images showing perfusion, as seen on nuclear medicine V/Q scans. Following renal ablation therapy, quantitative assessment of iodine concentration is possible allowing more accurate assessment of residual tumour, overcoming the limitations of qualitative assessment. In the work-up of complex gout, DECT allows visualisation, characterisation and quantification of urate deposits. In myeloma, unenhanced DECT is able to reconstruct virtual non-calcium images, which accurately demonstrate bone marrow infiltration with similar sensitivity and specificity to whole body MRI but in a fraction of the time. Finally, we use virtual non-contrast images to decrease patient dose e.g. in trauma 'triple phase'. DECT has already changed our clinical practice and has the potential to transform day-to-day radiology service delivery. Summary: A poster demonstrating the various uses of dual energy CT (DECT).References: 1. Forghani R, Mukherji SK. Advanced dual-energy CT applications for the evaluation of the soft tissues of the neck. Clin Radiol. 2018;73(1):70-80. 2. Johnson TR. Dual-energy CT: general principles. AJR Am J Roentgenol. 2012;199(5 Suppl):S3-8. 3. Hagspiel KD, Flors L, Housseini AM, Phull A, Ali Ahmad E, Bozlar U, et al. Pulmonary blood volume imaging with dual-energy computed tomography: spectrum of findings. Clin Radiol. 2012;67(1):69-77. 4. Thieme SF, Becker CR, Hacker M, Nikolaou K, Reiser MF, Johnson TR. Dual energy CT for the assessment of lung perfusion-- correlation to scintigraphy. Eur J Radiol. 2008;68(3):369-74. 5. Machida H, Tanaka I, Fukui R, Shen Y, Ishikawa T, Tate E, et al. Dual-Energy Spectral CT: Various Clinical Vascular Applications. Radiographics. 2016;36(4):1215-32. 6. Chou H, Chin TY, Peh WC. Dual-energy CT in gout - A review of current concepts and applications. J Med Radiat Sci. 2017;64(1):41-51.